In an age where the interior design world is dominated by neutral, sleek, and minimalist Scandinavian-style spaces, the rich and decadent home of designer, photographer, and creative director Neville Trickett feels like a triple-chocolate lava cake in a world of nonfat frozen yogurt parfaits. Neville is the real deal, as is evident in his personal style and his portfolio, and he has been collecting, designing, curating, and exploring spaces around the world for 25 years. The second I laid eyes on this house tour I stopped in my internet-browsing tracks. There is so much happening in each photo I can't even begin to describe or dissect them in detail so I'll just leave you to enjoy the tour. See if you can spot our Tretchikoff "Chinese Lady" Pillow below! 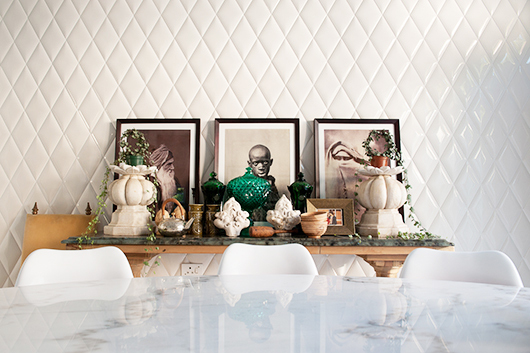 Thanks to Neville and SFGirlByBay for sharing this inspiring home tour!